European Union legislation concerning electronic communications media is firmly established as an essential part of the law in the field in Europe. From relevant provisions of the European Convention of Human Rights and the EC Treaty to numerous directives, the most recent being the Audiovisual Media Services Directive 2007, a supranational and interrelated regime lays an extensive groundwork on which practitioners, regulators, and service providers and other enterprises in all EU Member States must rely. • Article 10 of the European Convention on the protection of Human Rights and Fundamental Freedoms. The commentary interprets the law whenever possible article by article, section by section, and concept by concept, with reference to relevant case law and legal literature as issues arise. Illustrating their reasoning throughout with practical examples, the authors also take account of anticipated developments and future reforms that are likely to have an impact on the existing legislation. All texts are structured in paragraphs that are consecutively numbered to enable easy cross-referencing. Because national audiovisual media law must be interpreted in the light of primary and secondary European law, the commentary is vital for the interpretation not only of European media law but of national media regulation as well. In its analysis not only of the legal texts themselves, but also of the interrelation between the different laws and regulations, this book will be welcomed by legal practitioners, the media industry, lobbying groups, lawmakers, regulatory authorities, and broadcasters, as well as media service providers and academics. 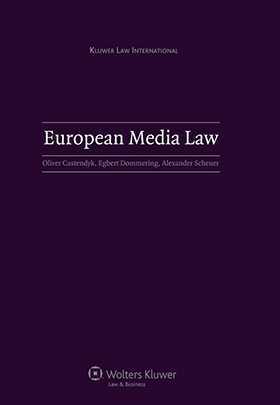 The project of which this book is the result was supported by the Institute of European Media Law, the Erich Pommer Institut for Media Law and Media Economics, and the Institute for Information Law of the Law Faculty of the University of Amsterdam. I. Introduction. Preface/Acknowledgements. User’s Guide. List of Abbreviations. II. Commentaries. General Introduction. Primary European Law. Article 10 ECHR (Freedom of Expression). Article 49 et seq. EC (Freedom to Provide Services). Article 81 EC (Cartels). Article 82 EC (Abuse of a Dominant Position). EC Merger Regulation. Article 86 EC ( Undertakings with Exclusive or Special Rights). Article 87 et seq. EC ( State Aid). Article 151 EC (Culture). European Media Law. Television without Frontiers Directive (TWFD). Audiovisual Media Services Directive (AVMSD). Related Directives. Copyright (Satellite and Cable Directive). Commercial Communications (Unfair Commercial Practices and Misleading and Comparative Advertising Directives). Information Society (eCommerce Directive). Electronic Communications (Access Regulation; Allocation of Frequencies for Broadcasting; and ‘Must Carry’ Obligations). III. Appendixes: List of Cases. Legal Texts. List of Participating Institutes, Editors, and Authors. Index.